I had a feeling the Portland Timbers match versus the Vancouver Whitecaps would end up going in one of two directions post RSL result - the Caps would eventually overwhelm the Timbers much like the season ending result to finish the 2016 season, or the Timbers would survive the onslaught and secure an impressive, albeit somewhat improbable result. It's not that I don't have believe in this team, but I know like many fans, there was plenty of shock in how well composed the club was down the stretch as several players made huge contributions late. From the various clearances to Jake Gleeson's point blank deflection of a missile courtesy of Brek Shea, the Timbers did just about everything to come away with a victory. Against all the odds and pressure, the Timbers pulled off one of their most impressive results that I can think of in the MLS era of the team. So now everything is back to normal and we've found the leadership and attitude that has been lacking and we can all go about our business like nothing happened? Well, not quite, because while it was certainly a gut-check victory, there are certainly signs of concern. Midfielder Diego Chara, making his first appearance after missing several matches with a leg injury, appeared to be having a groin problem that started when he took a hard foul in the first half. Showing gutty resolve, Chara stayed in the match to finish as the Timbers adjusted to have fellow defensive midfielder Ben Zemanski be more mobile in his attack while Chara confined himself to a somewhat centralized area. He did run some later in the match on a couple of breakaways, but obviously, it would be terrible to have a setback after just recovering. Midfielder Dairon Asprilla rolled his ankle on a run late in the second half, forcing Timbers Coach Caleb Porter to sub on T2 defender Harold Hanson into the match. Hanson had only been signed as emergency bench support for the Timbers to fill their game day roster, but he soon found himself helping run out the clock. It appeared there were other knocks and bruises, which are typical of a rivalry match, among the team, but Porter will have a full week of training to evaluate who's ready for the Houston Dynamo on July 29 in Texas. 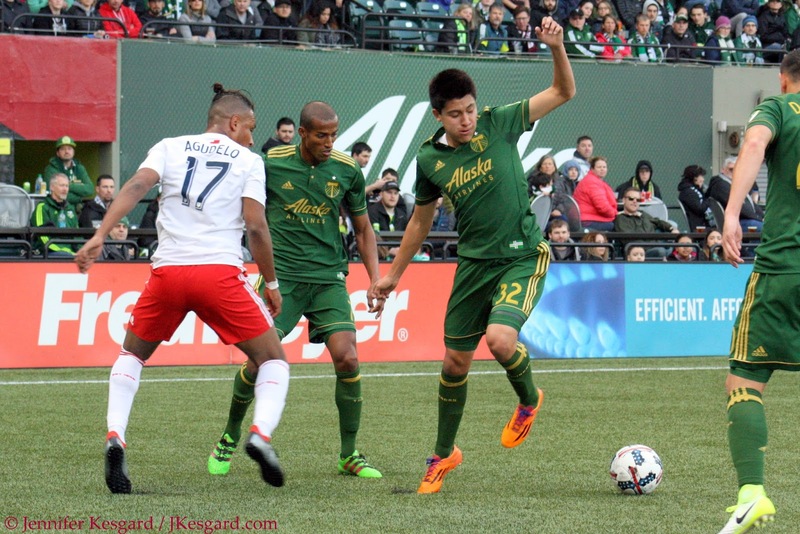 The Timbers are getting reinforcements at the right time. We know Fanendo Adi and Victor Arboleda will be back and available after serving their suspension for their respective red cards received versus RSL. David Guzman will be back from international duty with Costa Rica during the Gold Cup tournament. There is an outside chance that Vytas and Marco Farfan will be back from their injuries, while the Gold Cup finale on July 26 between Jamaica and the United States will mean that Darren Mattocks, Alvas Powell and Darlington Nagbe will also return to Portland (although I don't expect any of these 3 to play in Houston). With the emergence of Jeremy Ebobisse, Arboleda and Farfan, the Timbers are finally seeing some of their younger talent emerge as viable late match options or worthy of a spot start within the roster rotation; I have Jack Barmby already on that list and all he's done recently is tally a goal and show very well late versus Vancouver. The reinforcements are coming, and with Larrys Mabiala fully on board and Portland potentially adding defensive midfielder Bill Tuiloma (a Kiwi that has been playing in the Reserve systems for French side Olympique de Marsaille) to a contract, the team is trying to round itself out before the Summer Transfer window closes. Portland now has played 22 of their scheduled 34 matches in 2017 - 6 home matches and 6 away affairs, including a 3 match brutal stretch that sends the Timbers to Seattle, New York City FC and Real Salt Lake consecutively - so the time for setting and sorting has really begun if the Timbers want to remain in postseason consideration. Much of that comes with integrating new and returning players into their respective roles to find the best possible attack, but some of that also comes in players learning how to play together again. Portland will have plenty of practice time to address this and a somewhat favorable schedule in one respect - 10 of the final 12 matches are either Saturday and Sunday with just a Friday match (the reschedule of the New York Red Bulls match from August 20 to August 18) and a Wednesday match with Colorado at home on August 23. The Red Bulls - Rapids - Flounders stretch is the most compacted of matches in the remaining run, considering Portland has nearly 2 weeks before their September 9 date at Yankee Stadium. Portland is also tops in matches played in 2017 so far with 22 along with RSL, as the remainder of the West clubs have between 19 and 21 matches played so far. I'm looking forward to seeing what these 2 can do down the stretch. It's at this point where I need to find my towel. Porter said so much in several press conferences about helping the Timbers keep their highs low and their lows high, indicating that consistency and attitude are extremely important to help keep the expectations realistic. As someone who is very adept at creating drama rather quickly due to stress, unnecessary distractions or random rabbling, it's this point that I need to remember always. It's not nearly the fun sound bite or rallying cry like we've seen many clubs undertake during a postseason run, but it's that balance that will definitely help this group. Recognizing and utilizing reinforcements is going to be really key for Porter during the next few weeks to maximize the available points, but at the same point, it's important to remained focused. Ebobisse was very impressive versus Vancouver in his debut, but I think it's dangerous to anoint him as the next great MLS scorer after 78 minutes of soccer despite his talent. He showed great pace and strength during his runs, and I was surprised at his passing ability, but I'm not ready to demote Adi just yet. I do see the potential of an Adi/Ebobisse platoon where we use the strength and size of Adi and then change up tactics with the speed and pace of Ebobisse - very similar to the plan that Porter used when Adi and Maxi Urruti were together. Marco Farfan could be the answer for the Timbers' defense long term, but I'd like to see him get regular time before we anoint him the next coming.